Due to me buying my first appartment, I don't have as much time to blog as I would like. However, I do want to update you guys about a few recent buys I did a couple weeks ago, without going in depth. Of course I'm very excited about this appartment and I can't wait to tell you much more, but it still is not finalized. So I have to be a little bit more patient for now. Let's get back to business! Can't go wrong with this, right? I had some money left in my account and I wanted it to work for me, that's why I bought another share of QCOM. It turned out it was going to drop a bit more, but that doesn't really matter if you're expecting it to hold for at least another 25 years right? My portfolio page has been updated to reflect these changes. 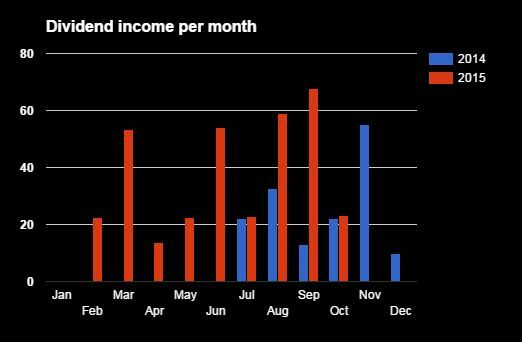 October was not a very exciting month, in terms of dividend income. 2 of the 16 companies I am currently invested in, paid me their dividends. With only $13 to go, I think it it safe to say I will be reaching this goal. That makes me a happy person, especially if you compare this to what my local bank would have paid me. If we compare this months result to last years, we were able to create a small increase. This is a 4.44% increase. It's not amazing, but with the power of compounding behind me, I'm still happy with this result! 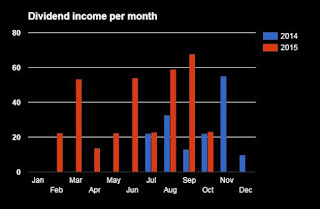 While it was a calm month on the dividend income, we cannot say this about dividend raises. On October 14th, OHI increased their dividend from $0.55 to $0.56. This is a 1.8% increase. Due to this change, my YOC is now at a very nice 6.31%. On October 21st, KMI increased their dividend from $0.49 to $0.51. This is a 4.1% increase. Due to this change, my YOC is now at a nice 5.86%. On October 27th, AFL increased their dividend from $0.39 to $0.41. This is a 5.1% increase. Due to this change, my YOC is now at 2.6%.